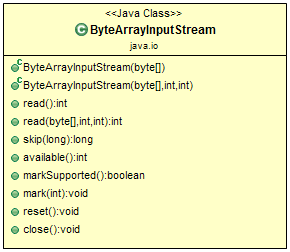 ByteArrayInputStream is an implementation of an input stream that uses a byte array as the source. ByteArrayInputStream(byte buf) - Creates a ByteArrayInputStream so that it uses buf as its buffer array. ByteArrayInputStream(byte buf, int offset, int length) - Creates ByteArrayInputStream that uses buf as its buffer array. int available() - Returns the number of remaining bytes that can be read (or skipped over) from this input stream. void close() - Closing a ByteArrayInputStream has no effect. void mark(int readAheadLimit) - Set the current marked position in the stream. boolean markSupported() - Tests if this InputStream supports mark/reset. int read() - Reads the next byte of data from this input stream. int read(byte b, int off, int len) - Reads up to len bytes of data into an array of bytes from this input stream. void reset() - Resets the buffer to the marked position. long skip(long n) - Skips n bytes of input from this input stream. The close( ) method has no effect on a ByteArrayInputStream. Therefore, it is not necessary to call close( ) on a ByteArrayInputStream, but doing so is not an error. The input1 object contains the entire lowercase alphabet, whereas input2 contains only the first three letters. A ByteArrayInputStream implements both mark( ) and reset( ). However, if mark( ) has not been called, then reset( ) sets the stream pointer to the start of the stream—which, in this case, is the start of the byte array passed to the constructor. This example shows how to use the reset( ) method to read the same input twice. In this case, the program reads and prints the letters "abc" once in lowercase and then again in uppercase. This example uses the try-with-resources statement to close the resources automatically. This example first reads each character from the stream and prints it as-is in lowercase. It then resets the stream and begins reading again, this time converting each character to uppercase before printing. 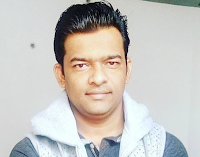 Hi I am Ramesh Fadatare from India, a founder, author, designer and chief editor of a website JavaGuides, a technical blog dedicated to the Java/Java EE technologies and frameworks. All the articles(1000 +) written by me so please ask if you any questions.Read more about me at About Me. Connect with me on Twitter, Facebook, LinkedIn, GitHub, and StackOverflow. Please comment if you have any suggestions or feedback about my articles would be appreciated. Happy learning and keep coding !!!. If you don't see above web page then please disable your adblock for our site Java Guides .This site is supported by the advertisement. Please disable your ad blocker to support us!! !